It’s cold and flu season and tons of people I know are sick right now. Besides a trip to the doctor and a lot of bed rest, there's sadly very little that will actually make you feel better. Thank goodness Hanukkah is here to remind me of the perfect medicinal treat that you can make at home. Chicken soup is called Jewish Penicillin for good reason. A nice sized bowl has been known to relieve cold and flu symptoms. Now throw in some matzah balls and that will make you feel better and put a smile on your face. I made a big batch of Matzah Ball Soup for the kids yesterday with some of the Chicken Stock I posted yesterday and they were totally into it. Traditionally, matzah balls can be gargantuan, so you can only imagine how big they look to a little kid. To avoid intimidating my little ones with basketball-sized matzah balls in their bowls, I rolled mine into little spheres, making them perfect for tiny mouths to eat. And these matzah balls are light and airy, so even when you're feeing under the weather, this nutritious soup won't weigh you down! 1. To make the matzah balls, place the first 5 ingredients in a bowl and mix until combined. 2. Cover the matzah mixture and refrigerate for 1 hour or until chilled. 3. 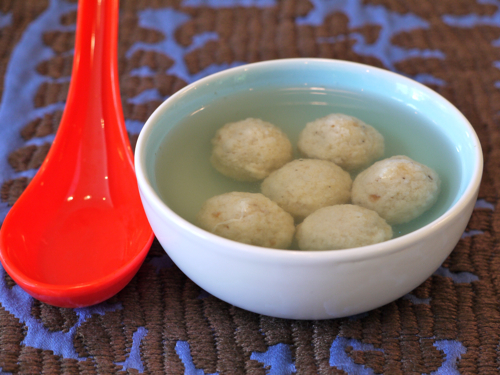 With wet/damp hands, roll matzah balls using about 1 tsp of the mixture for each ball. 4. Place the matzah balls in a large pot of lightly salted boiling water, reduce heat to a simmer and cook for 15 minutes or until the balls are soft and fluffy. 5. Warm the chicken stock in a separate pot and add the matzah balls and add accompaniments, if desired. Noted: Chinese soup spoon pictured with Jewish soup. Nice detail! What would be a good way to add some vegetables to this recipe? i always add sliced carrots,chunks of onion and parsnip as well as thin egg noodles.one of my friends adds fresh corn---sliced in circles from a corn cob.salted peanuts are also good. I love this idea! How fun and attractive for the kids! @Natlalia...I add chopped carrots, parsnips, and celery to our soup and my son usually goes for the carrots and parsnips. They are so tender and sweet when the soup is ready. He loves them!